This compact device offers small and medium workgroups cost-effective black and white output and colour scanning at up to 30 ppm/cpm. With an intuitive touch-screen display, excellent energy efficiency and its inner finisher, this device will save time and cost. The new imageRUNNER 2500 series of black and white multifunctional devices enable small and medium businesses to achieve greater levels of productivity, while saving space and cost. With a variety of speeds and configurations, the imageRUNNER 2500 series provides cost-effective printing, copying, colour scanning and advanced i-Send document distribution to network folders and email – all from a single user-friendly device. A large touch-screen display with intuitive menus makes the imageRUNNER 2500 series easy to use, enabling users to save time and do more. Colour i-Send increases productivity and transforms business processes. Users can quickly and efficiently scan in colour straight to a variety of destinations, including network and FTP folders as well as email addresses. Advanced LDAP search makes distribution to email quicker and easier through rapid address resolution, improving office workflow. In addition, these models offer the convenience of scanning directly to a USB memory stick. The daily demands of fast black-and-white printing are met with speeds up to 30ppm, first copy out times as low as 5.4 seconds and highly responsive recovery from sleep mode. 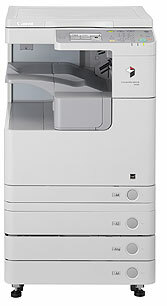 Combined with up to 2,300 sheet paper capacity, these Multifunctional Printers (MFPs) are ideal for busy, small and medium workgroups with high print copy volumes. The imageRUNNER 2500 series delivers superb 1,200 dpi* print quality at up to A3 size with optional staple and collate finishing. Continuous high quality output and peace of mind are provided with improved durability and serviceability. Canon’s e-Maintenance tool can further maximise uptime through its remote diagnostics capability, as well as provide automated meter readings and consumables monitoring to reduce administrative burdens. Canon’s world class service and support provides expert installation, training and on-site services, plus pre-determined Service Level Agreements. With click charging you only pay for what you print, which helps you gain greater control of costs. Excellent total customer experience is our priority – 93%* of customers are satisfied with the time it took to repair their equipment. *Based on TNS NIPO post service visit survey. Data from January to July 2009. 16,059 customers took part. All devices can be easily connected to your IT network, as well as integrated into your existing IT systems with PCL and optional PostScript support. Once connected, iW Management Console (iWMC) enables you to manage and monitor your whole fleet, from a single point of control. Department ID management safeguards important settings and helps monitor and control printing costs. For more advanced secure printing, follow me printing or accounting, these devices can be upgraded to offer compatibility with uniFLOW Output Manager. These EnergyStar certified models offer exceptional energy efficiency, consuming as low as 1.5 watts power consumption in sleep mode to save energy and cost. Highly productive double-sided printing, as standard, saves more cost and time as well as paper.